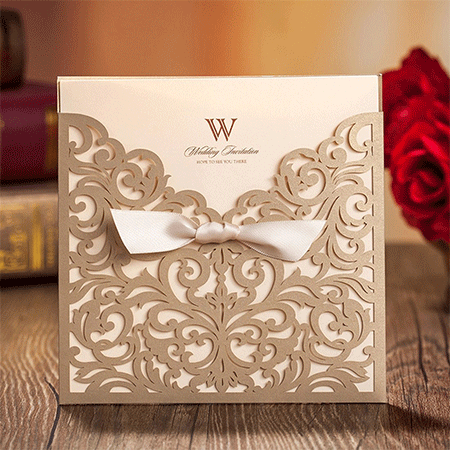 Laser cutting allows for the creation of intricate and elegantly designed wedding invitations. These delicate invitations can be one of the high points of the most memorable day in your life. They can be ordered complete or with the printing left undone, so that you can create an invitation that is uniquely yours. 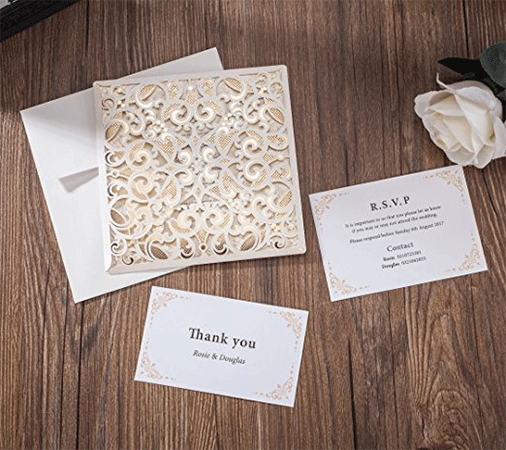 When selecting the best laser cut invitation for you, there are a few factors to consider. Although they can be quite beautiful, laser cut designs will weaken the integrity of the paper. So, you will want to make sure they’re made from sturdy, high quality card stock. You will also want to check out the manufacturer and make sure they have a reputation for producing quality work. 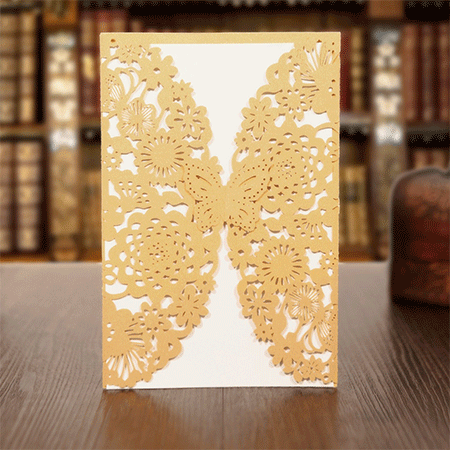 This laser cut card is designed with an intricate floral design on the front flap. It comes in four quantity options, from one to one hundred, and the color is cream with white accents. Every card comes with a blank inner sheet and an envelope with seal. Also, included with are an RSVP and thank you card that are coordinated to match the invitation. The inner sheets will be printed for you, free of charge, if you’re ok with black ink. However, if you want a different colored ink you will need to either pay extra or print them yourself. Arrangements for the printing must be made, by email, prior to confirming the order. This one colored, square invitation features four laser-cut flaps that fold in to the center. Both the pocket and insert are the same color, pinkish beige. The floral design is ornate and delicate. This is a card kit, so it does require some do it yourself creative efforts. Unfortunately, unlike most of the other cards listed here, this invitation does not come with mailing envelopes. The inserts, however, can be custom printed to suit your needs. This square card has four laser-cut flaps, with intricate designs, that fold in on each other across the entire front side of the card. Each card comes with matching RSVP, thank you, envelope and seal, and blank inserts that can be printed by the company, before shipping, or after the order is received. The plus side to printing them yourself is that it can be done in any color you wish, but you will have to pay extra for any color, other than black, printed by the manufacturer. The cards can be ordered in quantities of one, twenty-five, fifty or one hundred, with the highest count, of course, being the most cost effective. The design of this card is rather unique, in that its two floral flaps are adorned with half a butterfly at the center. The two halves interlock to hold the pocket closed. It is sold in quantities of twenty-five, and is offered in four color combinations: gold pockets with an ivory insert, gold pockets with a white insert, white pockets with an ivory insert, or white pockets with a white insert. The inserts can be custom printed, by the customer, using any word processing software that allows you to print on custom-sized pages. This beautifully designed invitation features a beige, flowered, laser cut design laying over a gold pocket holding a beige insert. This card is sold in packages of 50 that include a blank insert, envelope and seal. Like other cards by this manufacturer the insert can be printed in black, for free, or other colors for an additional charge. However, these cards do not come with RSVP or thank you cards, like many of the others do. This card is unique because it comes as a do it yourself kit. The outer card pocket is a laser cut flower design on gold cardstock. It is adorned with a small bow made from ribbon. The inner sheet, which is a beige tri-fold piece of printable paper, is prepared for your custom printing. The kit comes with mailing envelopes and seals. Because these cards are do it yourself, they are a bit cheaper per unit than the pre-printed cards. However, they do require some software skills, as you will be designing and printing the inserts yourself. Rather than flaps that fold open to reveal the inner sheet, this card features an ivory pocket with a bold ribbon design. Between the interwoven ribbons is a delicate, laser cut, floral design. 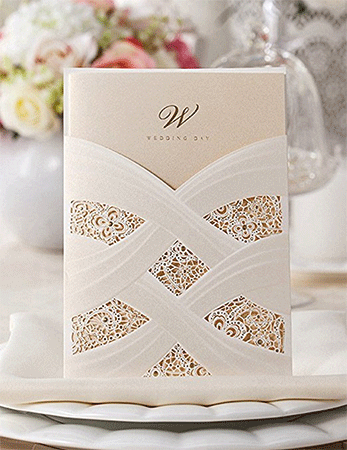 A beige and inner sheet, emblazoned with a gold “W” and “Wedding Day” is designed to slide into the pocket. 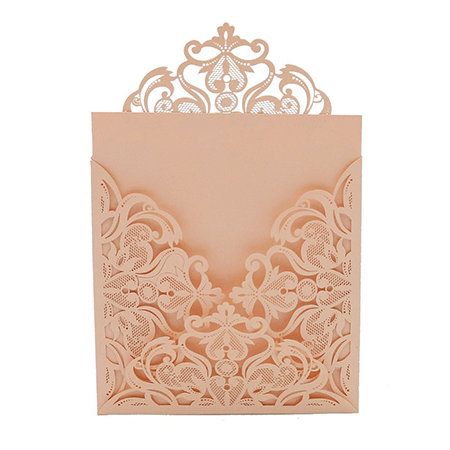 This invitation is sold in quantities of one, fifty or one hundred, and includes envelopes with seals. These invitations are sold with the custom printing included, but you do need to send instructions to the company prior to ordering. 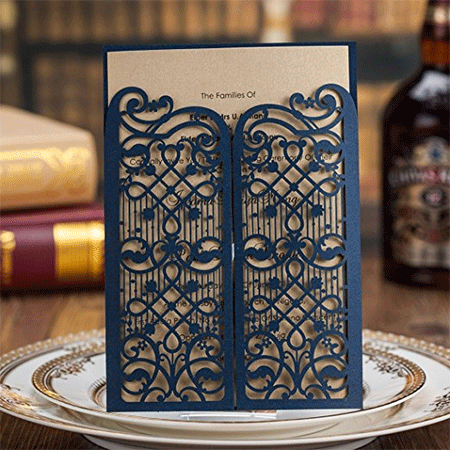 Embellished with navy blue, laser cut, double flaps over a shimmering gold insert, this card is striking in its detail The inserts can either be printed by the manufacturer or by the purchaser. Included with each card is an envelope and seal. However, it does require Adobe Illustrator software for the design and printing of the insert. This card is sold in fifty count packages. 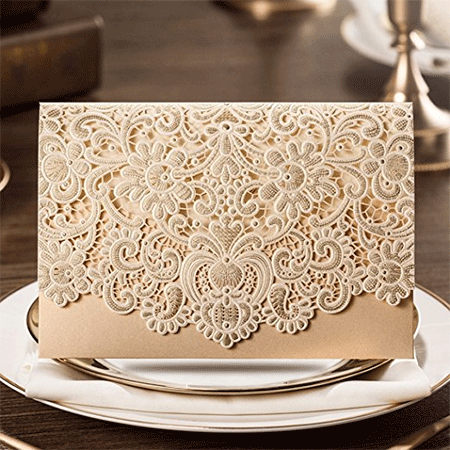 A beautiful lace flower design adorns this stunning square invitation. 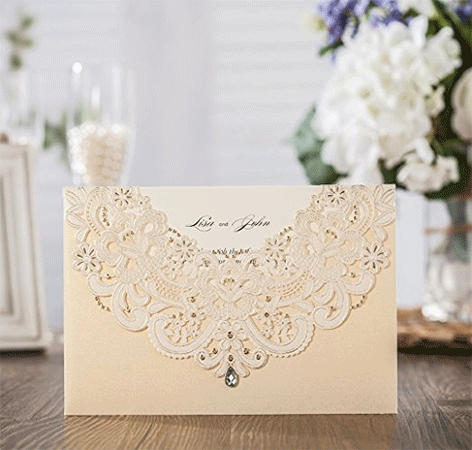 The beige pocket and gold inner sheet, along with the graceful laser cut design, give this card a striking visual contrast. This invitation can be ordered in multiples of one, fifty or one hundred, and comes with the pocket, insert, mailing envelope and seal. They are custom printed, so the customer will want to contact the manufacturer with those instructions prior to placing the order. 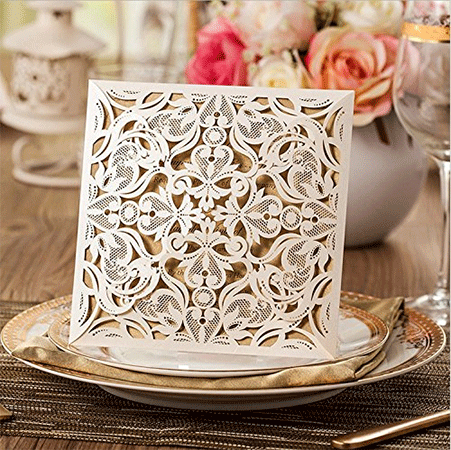 This square card is decorated with delicate flowers laser cut out of ivory card stock. 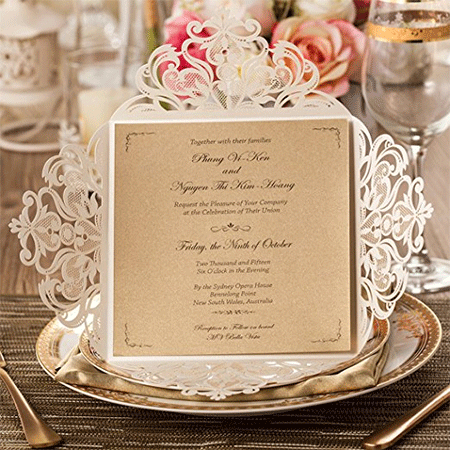 The contrast of the shimmering gold insert is stunning, giving the invitation a classic and extremely delicate look. Envelopes and seals, but no RSVP or thank you cards, are included. The insert is left to the purchaser to print and Adobe Illustrator is necessary for this. It’s easy to see why this amazing card made it to the number one position, it is nothing short of stunning. With so many designs and colors to choose from, it’s obvious why custom laser cut wedding invitations have recently become so popular. This will be the first peek your guests will have at all the thought and hard work you have put into your wedding, so it is important for your invitations to be special.